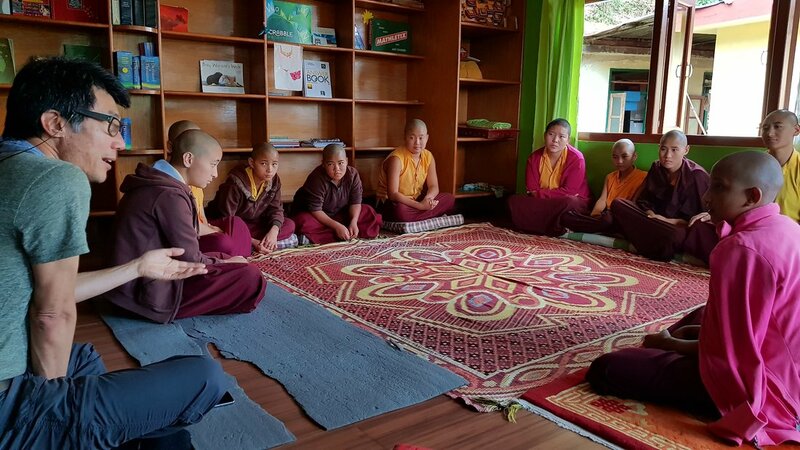 Coorain is happily involved in visiting and supporting Karma Chokor Dechen Nunnery in Rumtek, Sikkim. We have done this with friends from the Wangapeka in New Zealand as well. We make regular trips to Rumtek and have close practice links with the nuns. This has been developing for about 25 years now. Our relationship with the Tibetan teachings, however, go back much further. At the same time we maintain our relationship with HH 17th Karmapa Thaye Dorje and his community. Our friendship and support extends back to the previous Karmapa (over 55 years). 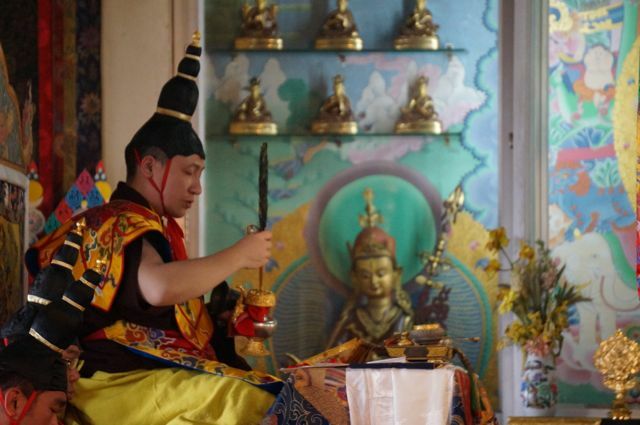 This is a beautiful and moving portrayal of everyday life at the Rumtek Nunnery. Em edited and produced this gorgeous HD film from footage she took during her stay in 2016. Please also have a look at the 'Zines produced by the Nuns as well as videos of traditional Pujas (also shot by Em), which you will find on the Online Offerings page. We aim to support the genuine independence of these women and girls by our own efforts but also to encourage a more generous relationship within their culture. They need their welfare needsto be better recognised. Supporting the nuns supports these principles and maintains our current lineage network. 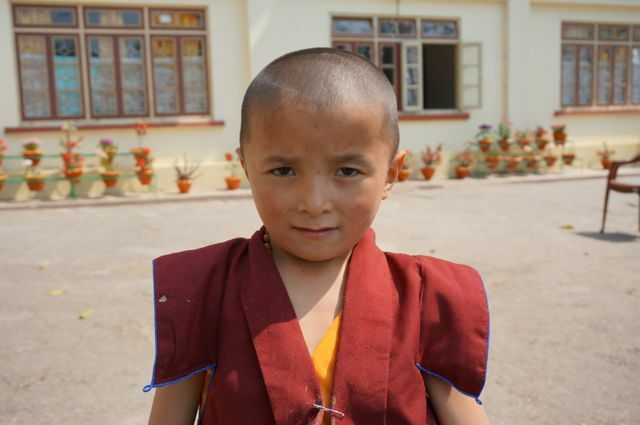 As of May11th, 2014 we have pledged our support to the Rumtek Nunnery, whose operating costs per year are about $15,000. Members of the Coorain community visit Sikkim. People can apply to join. All inquiries through Chime or Anne at Coorain (08) 9764 1275. The nuns can really use teaching in English proficiency and English as a second language teaching. Fine Tibetan medicinal incense made by our dear friend, Mr. Jigme Tsarong is purchased and sold on. No one takes a profit and all money raised goes to support the nuns in a very practical way. Coorain organises these projects and over many years of involvement has strengthened a valued relationship with our Tibetan friends in India. Richard, Gaby and Em visited the nuns in late October 2017. The nuns were wonderful, generous hosts, as usual. 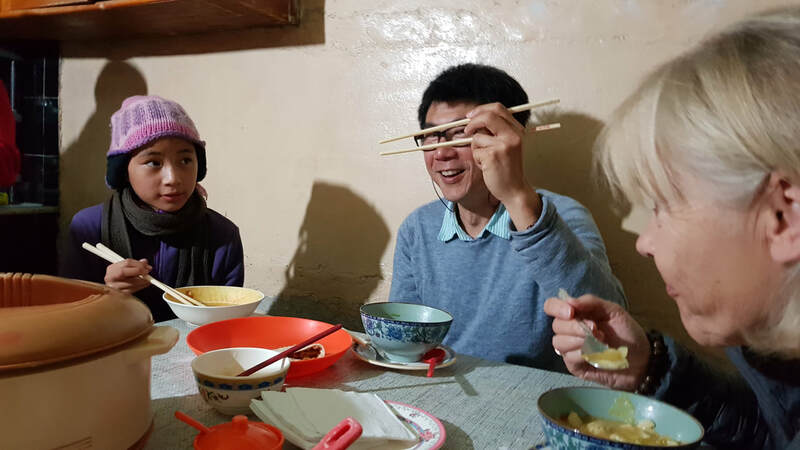 Richard ran a health check clinic to establish a sense of the nuns' health needs, and taught a class on Refuge; Em taught some karate (at the small nuns' request); investigations into computer facilities were made with a view to setting up online education options. Five new nuns have entered the fold, ranging from teens to mid-40s, and are already settled well. The mood was positive and welcoming all round. The nuns rooms have been renovated to reduce damp and improve health, they look great. The greenhouse is producing plenty of chillis, squash and spinach, and the nuns enjoy the garden work. Requests are being made about repairs to the gompa, which must go through official processes - it is possible the gompa will require complete replacement, which is not a simple request as specialist monastic builders must be employed. Ani Tsultrim is investigating the way forward with this. 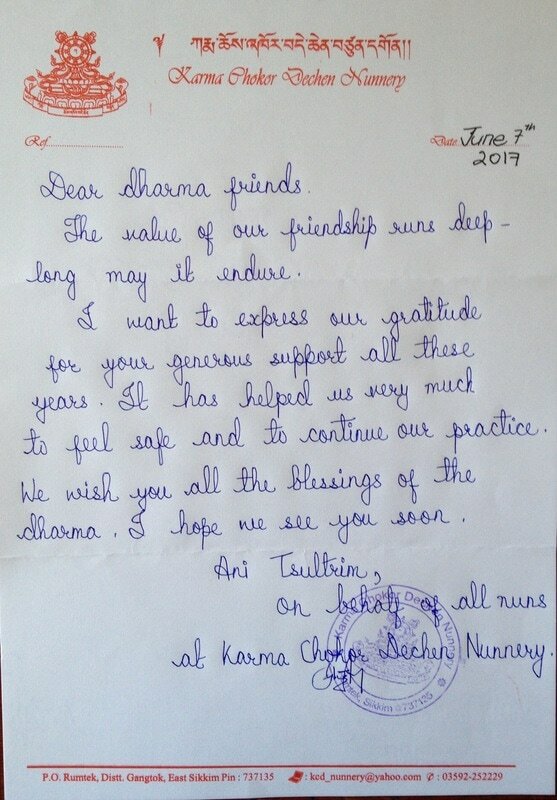 Ani Dechen (one of the senior nuns) is on 18 month meditation retreat at present, this may enable more advanced teaching in future. 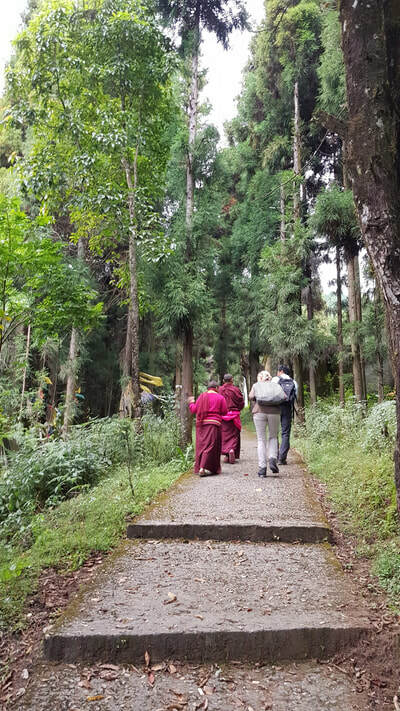 The nuns also took us to visit Ani Minjurla's cremation site near the old Rumtek monastery. It is a beautiful, peaceful site in juniper forest. We were also shown through several decades of Ani Minjurla's personal photo collection, which included old photos of meetings with the 16th Karmapa, Shamar Rinpoche, the past and also present Jamgon Kongtrul Rinpoche, and many other famous and historical teachers, as well as her beloved young charges, many cats, and her hat collection(!). It was a lovely gift to share in the memories and connections. All money in this account is held in trust for the nuns and is transferred monthly.